To stand the best chance of getting a job that will lead you down the road to success and personal satisfaction, new recruits should be well-versed in understanding the industry they want to target, be prepared to share openly what they can bring to the table for their new employer and research the company they are applying to. These are evergreen tips that apply in any job market—whether that means you have potential employers beating down your door or you are applying to multiple companies at once. DB Schenker purpose statement, says ‘we advance businesses and live by shaping the way our world connects’. This truly defines the mantra that we use to help foster development and shape our people at Schenker. With numerous positions, open at any given time here at DB Schenker, new recruits can easily move from an entry-level role to a managerial role. Our organization has 140+ years of success deeply rooted in the passion, commitment, and attention to detail of its people. Ramirez says DB Schenker offers potential employees a wide range of opportunities through a variety of positions that are currently available. As part of that mission, the organization looks for goal oriented, enthusiastic professionals who can implement its mission and growing with the company. Explore your options with an internship. 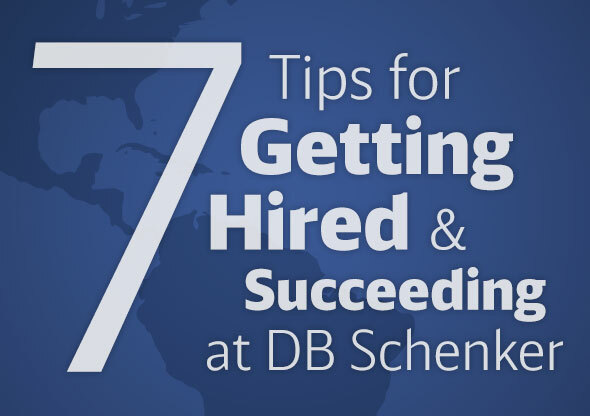 DB Schenker’s internship program is a great starting place for an entry-level employee. Interns learn all about the day-to-day responsibilities of a logistics professional and will encounter new challenges to help them grow as professionals. The internships last up to six months, with positions typically in geographical areas such as Germany, Australia, USA, and Indonesia. All of DB Schenker’s interns are compensated for their work at a rate dependent on the current salary rates of the respective countries. Pick from various functional areas. Either through an internship or on your own, take the time to explore the various functional areas of the logistics and supply chain industries. There’s finance, information technology (IT), human resources, contract logistics, and myriad other departmental areas to select from. The latter, for example, employs numerous engineers, while the IT innovation team explores various “futuristic opportunities” within the logistics space. Show a willingness to grow and transform. Even if you loved your last position, a new start at DB Schenker is sure to translate into fresh opportunities and the chance to grow and prosper. Ramirez says the company seeks out professionals who not only have a strong track record, but who are eager to start anew and make their marks at a new organization. Think internationally. With logistical services and operations in over 130 countries worldwide, the opportunities to work domestically or abroad are plentiful at DB Schenker. And if the time comes to pull up your roots and find a new place to live and work, the job opportunities will be plentiful. For more information about career opportunities with DB Schenker, visit our job portal here.